How many amp hours does a compressor fridge consume? I am looking at a solar setup that includes a compressor fridge (Secop / Danfoss) and I want to get an idea as to how many amp hours per day the fridge will consume. The fridge is rated to draw 2.5-5A depending on ambient temperature and whether it is in fridge or freezer mode. Does a compressor fridge draw this amount of current continuously 24/7? If so then I can expect it to consume 60-120Ah per day. Is this what I can expect or does a compressor fridge only draw charge part of the time? There are many factors which determine the duty cycle, ambient temperature, how many times the door is opened, how much product is inside, how much warm product is stocked, thermostat setting and so forth. The compressor won't run 24/7 but will cycle within the throttling range of the thermostat setpoint, perhaps 1-2 degrees plus or minus, baring leaving the door open. For the past month I've been logging my refrigerator's consumption with a power logging device, nothing has changed much with regards to content habits etcetera, but there is a clear correlation during the hot days we've had lately and consumption increase, perhaps a 15-20% increase. So the real answer is it depends on all the above factors, but a rough guide would be to assume a 33-45% duty cycle, only real data logging will reveal the actual consumption. The energy guide figures provided with my unit are pretty consistent with what I've logged so far, but 1 month is less than 10% of a year, but honestly I don't see too much that would indicate an increase much above said guide figures. For the sake of system design using a 50% duty cycle probably won't lead to dissapointment, in othere words don't underestimate, for many the refrigerator is the single highest consuming load, it never sleeps, just takes naps every so often. So could I roughly work on the assumption that if the fridge draws 2.5-5A with a 50% duty cycle then it would consume around 30-60Ah per day? What I am wanting is an upper limit to use as a basis for determining the battery bank size and solar panel wattage required. That's what I would use, a 50% duty cycle just to reduce a 'Jack in the box supprise" the refrigerator to me is the single most important load, I made many underestimated decisions in the past which cost me dearly, then again education is not free, unless it is offered for free, never underestimate, in fact double the anticipated needs, you won't regret it, the sun can be unpredictable at times. I'd try to clarify the amp draw rating in terms of whether it's an average or max draw. If max, you can use an estimated duty cycle to get average daily consumption. The rating may be an average draw though, in which case the duty cycle would already be taken into account. It's may well be max draw, but given there's a potential 2-3x margin on the consumption between max and average, it might be worth clarifying. I have an 11.5 cubic foot Insignia fridge/freezer. The Energuide rating is just over 300 Kwhr/ year or approximately 1 Kwhr per day. I think that is a good starting point as practical monitoring seems to agree with this figure. You can go back to amp hours depending on your battery voltage with the usual conversion losses. That’s a good point. I’ll need to confirm this with the manufacturer. The following energy consumption rating is in the product documentation (see below). It’s not really clear. I’m not sure what the units A/HR actually means. I’m guessing they mean “Ah per hour” in which case the duty cycle may have already been taken into account. In the extreme case where both compartments are on freezer with ambient temperature over 40°C, the manufacturer quoted a rating of up to “5A”. If the duty cycle is taken into account then this would represent a potential consumption rate of up to 120Ah per day. Does this sound correct with regard to the energy consumption that would be expected of a Secop / Danfoss compressor? I assume that this energy consumption rating is an average and the average current draw is about 2.85A at 12V which is in the ballpark of what was quoted for the fridge that I have been examining. That does sound like duty cycle is already in the numbers. A/Hr is a rate. Ahr is a quantity. 1.5a (rate) run for 1hr = 1.5ah (quantity). At 1.5a/hr, quantity would be 36ah. At 2.8a/hr for combined fridge/freezer, that would be 67ah or 800wh per day, which sounds about right for a typically insulated commercial DC unit. My danfoss compressors can have speed set via resistor values wired into control box. Higher speed makes it cool faster with higher amp draw. Presumably, the "up to 5A draw" would be in a case where the compressor has the resistor value for max speed. Running faster would mean a lower duty cycle, but my understanding is the overall consumption (ah/day) is a bit worse running at higher speed (likely because of limitations in dissipating heat). I have 2 Grape Solar GS-5 5.0 cu ft referigerator's running directly from 24 volt bank of L-16's One is normal temp 36-39 degrees, the other is a vegetable box running at 44-48 degrees. I have Chinese volt/amp/watt/kW totalizers on each unit, been logging them for a year now. Cool box runs 30-35% duty cycle and is opened >12 times a day total power per day is 300 watt hours. Veggie box runs 21-25 % duty cycle and is opened 2 times a day. Total power per day is 200 watt hours. these referigerator's have a Chinese knockoff of the Danfoss compressor , The Colku, I've seen both compressor setups up close and they are close to identical , both are DC permanent magnet motors, are variable speed. Huge price difference, I was looking at >1200$ for the Sundanzer upright which I never found. I saw the Grape Solar at Home Depot online and paid about $800 for the first one delivered to my local Home Depot. It failed in about 11 months into the 1 year warranty , freezer compartment door hinges broke off, resulting in loss of temperature control. Grape Solar warranties it and shipped me a new one no charge. I made a patch fix for the broken one with a styrofoam plug in place of the freezer compartment. This one is the warm box now. No freezer as temp in main compartment is too high. Unfortunately Grape Solar has exited the DC referigerator business. They had a good product! The unit Amp is already a rate (Coulombs per second). So I’m not sure what adding “per hour” actually means. It sounds like a unit of acceleration of electrical charge. Is “Amps per hour” a unit in electrical engineering? It does sound like the duty cycle is already taken into account. The quoted 5A draw was for when both compartments of the dual zone unit are set to freezer and the ambient temperature is extreme (> 40°C). I believe the Sundanzer DC fridge is one of the most energy efficient units out there. Do you know whether they are still available? Green Energy Innovations, Many models , mostly uprights, Asian imports. They have sent me catalogs but when I poke the website I find maybe another company, same name doing commercial LED lighting, not sure if they are in the business. Uprights only only but in a size that I have never seen in America. All units 19" wide by 19" deep ???? I had an Isotherm Cruise 130 with the Danfoss BD35 and Isotherm's ASU technology that I instrumented. On a cool, overcast day it would use about 15Ah. On a scorching hot day it would use about 70Ah. YMMV but for a medium sized fridge those numbers should be representative. Of course if you have a dual compressor fridge like the Cruise 195 you probably need to double those numbers and a smaller fridge would use less. 118 & 142 liter 160. ". 120. " 198 liter. 200. ". 150. My catalogs have confidential dealer pricing so probably not valid for 1 quantity. I am not a dealer for them, they would like me to be. my my grape solar units use. 13.6 volts 3.4 amps or 27.2 volts 1.7 amps. 46 watts . rated max draw is 95 watts, I have never seen it draw that much. Also has 120 volt converter built in , have used it but did not log that. TechnoDave has correctly addressed the Amp vs Amp*Hour question (Amp/hour or Amps per hour is not a useful/meaningful unit/number for us here). And, as Dave showed, when talking about Amps and Amp*Hours, you need to know the working voltage. Typically (from what I have seen) the DC Compressors from Danfoss are 12/24 volt capable units. And they are constant power (watts) where Power=Voltage*Current. Running on a 12 volt bus, the compressors draws 2x more current (amps) vs running on a 24 volt bus. However, power/energy wise, they are about the same Watts and Watt*Hours per day (remember power=volts*current, 2x more voltage and 1/2 current is same power). I have been testing out a regular medium size upright fridge that runs on 240V as an alternative to a DC fridge. The fridge is rated at 360kWh per annum which equates to 986Wh per day. I have tested with a watt meter in my home socket and found that on start up, the wattage surges to almost 1000W for about 15 seconds. Is this typical of upright AC fridges? So in order to run the fridge off a 12V AGM battery bank, I’m guessing I would need a minimum 1000W inverter to cope with this surge. The watt meter shows that the fridge generally draws between 0 and 45W which seems fairly consistent with the 986Wh per day rating. I am trying to compare running an upright AC fridge off an inverter compared to running a DC compressor chest fridge / freezer directly off the battery. I am assuming that running an inverter is going to result in some power loss. Typically how would the power consumption compare in these 2 scenarios? In the US, an AC fridge draws around 60 watts (and upwards of 100 Watts when first cooling a "warm" fridge). And a 600 Watt AC inverter does not quite have enough surge power to start one. Also, if you have a "frost free" unit, the defrost heater may run around 600 Watts for a short period of time every 12 or 24 hours (timer circuit typically). Generally, the recommendation is a 1,200 to 1,500 Watt AC inverter minimum--And this gives you some extra energy to run LED lights, laptop, etc. Battery bank size... AGMs have higher surge current support (C/1 or even higher) vs the best a FLA battery can do around C/2.5 (2.5 hour discharge rate). Nominall, for a FLA battery bank, a 1,500 Watt AC inverter would need around a 600 AH @ 12 volt or 300 AH @ 24 volt FLA battery bank for "reliable" starting (a 1,500 Watt AC inverter should surge around 2x rating or 3,000 Watts). And if we use the "rule of thumb" for FLA batteries, we would need a 600 AH @ 12 volt battery bank to "reliably" supply enough surge energy to start a typical full size fridge. So, you could either go with a larger battery bank (and larger solar array to support >1,000 WH per day), or if this was your only load, then run AGM batteries to have better surge on a 392 AH @ 12 volt battery bank. And then, we have another "little" problem. There is typically a small mechanical defrost cycle timer (in less expensive refrigerators). If you have the inverter on "sleep mode" (mostly off until >8 Watts of load), this causes the defrost timer to run "slow" (only AC power when the compressor/heater/fans are running). One member here ran a test and found that his 12 hour timer, when disabled, started using more energy to cool at ~24 hours without defrost cycle (frost inhibiting airflow/heat transfer?). Then there are the more expensive frost free which may have an electronic timer... If the inverter goes to "sleep", they may start an immediate defrost cycle. For example, if your 1,500 Watt inverter uses 20 Watts "on" (tare losses), 20 watts * 24 hour hours per day = 480 Watts... Almost 50% of the power of the refrigerator itself... So that has to be taken into account too. In larger off grid system, the inverter Tare Losses are usually small compared to the loads (larger array, larger battery bank, more loads and the inverter has to be on all the time anyway). If you are using a "manual defrost" fridge, then the defrost timer is a non-issue. I use 1/0.85 (85%) to upsize the array and battery bank for "typical" AC inverter losses. On cycling loads (fridge on 1/3rd hour, off 2/3rds hour in cool climate), then the inverter tare loss may have to be manually added (inverter running 2/3rds time with no loads). I am not sure that DC compressors are that much more efficient by themselves... However, it is very possible that the DC refrigerators have better insulation. A typical efficient fridge may be 1,000 WH per day (hopefully frost free model). A converted chest freezer running at refrigerator temperatures can be down towards 250 WH per day (better insulation, chest freezer less loss of cold air when opened, no defrost). Roughly, it seem in the USA that refrigerators are "measured" at 95F/35C (when the refrigerator company is not "cooking the books")... At 70F, they do use less power. If you are making ice, adding "warm food", power usage will go up. I will have 2 x 390Ah 12V battery banks on daily charge rotation on a generator. My expectation was that a DC compressor chest fridge would draw no more than about 4-5A (upper limit at high ambient temperature in freezer mode) which equates to 120Ah per day or 1,440Wh per day. More likely it will draw only 3A or 72Ah per day or 864Wh per day. If I work on a 50-60% maximum battery DOD then even at 5A consumption, there should be adequate charge left over to charge a laptop, phones, a water pump for a shower and LED's. Are you saying that to adequately support a typical upright 240V AC fridge, I would need to add another 210Ah to each battery bank as well as getting a minimum 1,500W inverter to cope with the periodic surges? When the refrigerator starts the compressor motor draws locked rotor current for a few milliseconds ramping down once up to speed, it's this inrush which requires a large enough inverter to cope with this current. When this occurs the DC current is, in the case of 12V to 240V, twenty times the AC value, so for example a 50A inrush at 240V would equate to 1000A, with that amount of current the DC voltage sags perhaps to 10V or lower momentarily, this can cause the inverter to fault on low voltage. These inrush currents cannot be measured without an ammeter with an inrush capture feature, due to the very short duration. This is why inverter type refrigeratorsare so useful, they have no inrush to speak of, meaning a 60W compressor would happily run on a 300W inverter. If you are using Flooded Cell Lead Acid batteries, for a 12 volt bus, roughly 250 Watt max inverter load per 100 AH (at 12 volts) battery capacity is suggested. These are very rough rules of thumbs that are intended to get you a working system. AGM batteries support more surge, and you may only need a 1,200 Watt AC inverter, surge is less. Standard compressors very easily run 5x running watts when starting (my fridges draw around 120 Watts at max load, or >600 Watts/VA starting surge). The "inverter compressors" for AC systems (and "linear compressors") in the newer refrigerators don't use single phase induction motors... They use 3 phase induction motors or 3 phase permanent magnet motors (linear compressors are different yet). The electronics are typically a form of VFD (variable frequency drive). These can make soft start (almost no surge) as they bring the frequency up from near zero Hz to running frequency for the compressor. Very "off grid" AC inverter friendly... But for utilty power, the surge reduction does not really do much for your home. For DC refrigeration compressors, they to have a version of VFD to convert DC to 3 phase AC -- Again soft start / variable frequency. Saves you the off grid AC inverter and these DC compressors are frequently 12/24 VDC compatible. In the US, full size DC refrigerators tend to be pretty expensive. If all you need is refrigeration, then the smaller system may have lack of surge current support. If you need refrigeration plus power some other stuff, typically, the battery bank is already large enough (2 days of storage energy, 50% max discharge) to support your refrigerator starting load. Flooded Cell Lead Acid batteries tend to need 6-8+ hours of charging current if they are deeply cycled towards 50% state of charge or lower). If you discharge (typically) 75% state of charge, you need about 1/2 that time--And this fits "solar charging/daytime charging in available sun, especially towards winter). You have competing specifications (pure energy storage and surge capability). And then there is cycling batteries between the application and back to a genset--And the question of how many hours a day you run that. Smaller AGM (or possibly even LiFePO4 type batteries may be "nicer for your needs" (lighter weight, lower AH storage capacity, vs your heavier/larger AH battery bank if using FLA batteries). Is there some reason for "rotating your battery bank" from application/load back to a genset for charging? Solar array not "practical" for your location? 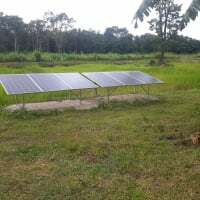 A solar array is not suitable in this forest setting with insufficient solar exposure, Generators are not permitted in the forest camp region so have had to setup with 2 battery banks - one setup at the campsite and the other a distance away on charge where generators are permitted. There is mains power available near where the generators are permitted so another strategy is to run the upright fridge on mains for freezing only and use a 100L DC chest fridge in the camp area running off the battery bank. I'm thinking this might be the most energy efficient setup which will maximise time between battery bank rotations. I have a small DC chest unit I use for transporting food to the cabin, and it's quite the power pig. IIRC, runs ~8a constantly. At > 2kwh/day, that's more than my full size AC fridge, and ~10x my home built DC chest that's about 4x the capacity of the portable chest. There may be more efficient portable units out there though.